Zenbu is now available for EE3! The latest version of Zenbu for EE2 is also included in the package. Zenbu* is a powerful and customizable channel entry manager that enables you to view entry custom fields, entry ID, title, URL Title, categories, author, status, date, channel, edit and/or expiration dates, and more, all in one list! It works similar to ExpressionEngine®'s Edit Channel Entries section in the control panel. Get the Zenbu + Henshu (Zenbu Edit) Bundle (for EE2) for 120$ and save! Get the Zenbu + Hokoku (Zenbu Export) Bundle for 120$ and save! * Zenbu comes from the Japanese word "全部", which means "all" or "everything". Display entry data the way you want it. Show/Hide any entry data or custom field, and change the order in which data is presented with simple drag&drop. Similar to email applications, add and remove as many filtering rules as needed to narrow down your entry search, and your entry list will refresh accordingly. For example, want entries associated with Category A and B, but not Category C? Want only closed blog entries written by yourself, that contain the letters "EE"? 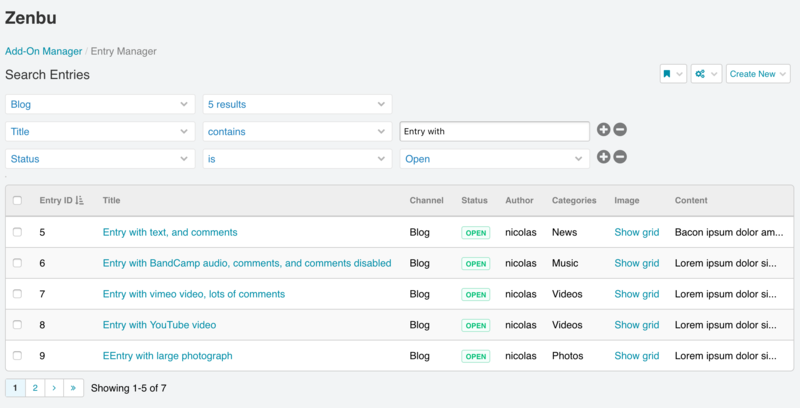 Filter your entry list results by category, author, status, sticky, entry date, keyword, and more! Zenbu lets you search entries for keywords in specific custom fields as well! The combinations are endless with an easy to use, flexible and powerful filering system. Add to this a handful of search terms such as "contains", "does not contain", "starts with", "does not start with", "ends with", "does not end with", and "contains exactly", and you can imagine the power that lies within Zenbu for searching entries. Clients and Developers alike will be thrilled by the ease of finding the entry information they're looking for, without having to visit individual web pages or entry forms. The search filters used to narrow down your entry searches can be saved for future use so that you don't have to recreate your search filters every time. Searches can be added and removed, and can be labeled for easy reference. reduce the amount of characters displayed in text-type cells?? display HTML synthax when viewing text custom fields? format (or stylize) entry/edit/expiration dates? In addition to the above, Zenbu has a number of extra options for fieldtypes and other common entry attributes. Don't want to display all fields to a specific member group? Set up what and how data is displayed and in what order, and save these settings for your own member group, or to other member groups (depending on your access permissions). Control which member groups are allowed to access their display settings and the member access panel, which groups have a channel dropdown in Content => Edit, and who can save display profiles to other member groups. Additional filtering of entries: by sticky state, author, keywords in the entry title or specific custom fields. Quicker management of entries: Checking off entries and editing, deleting, adding/removing categories for multiple entries is more easily accessible and simple to use. 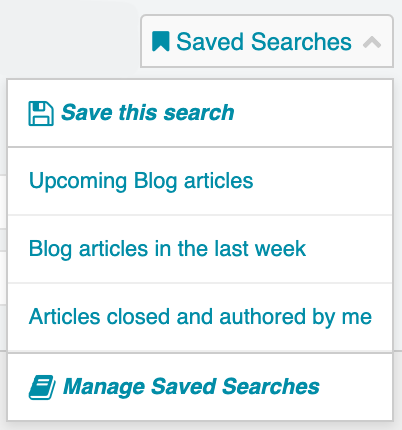 Saved Searches: Save your filtered searches and have quick access to them in the future. Change the order of columns in entry listing through simple click&dragging in display settings page. Show/Hide specific columns in entry listing. Text trimming in entry listing for text/input/wysiwyg fields. Customized display profiles per member group. Copying and setup of display profiles for other member groups. Access settings to show/hide the addon's settings or admin pages for each member group. ... and more in the future! Zenbu* is a powerful and customizable channel entry manager that enables you to view entry custom fields, entry ID, title, URL Title, categories, author, status, date, channel, live look, comment count, sticky, edit and/or expiration dates, view counters (EE docs), last author, and more, all in one list! It works similar to ExpressionEngine®'s Edit Channel Entries section in the control panel. Get the Zenbu + Henshu (Zenbu Edit) Bundle for 120$ and save! Editing multiple entries can come in handy, but not when you have to scroll/click, scroll/click, scroll/click at each entry. Zenbu streamlines the process with an improved multi-entry layout. Group-change entry statuses, sticky and "allow comments" settings with the click of a button. Note: Editable elements are the same as those provided in the native EE multi-entry editor, but with a much more streamlined interface. Custom field editing is not possible at the moment. No more opening the entry form or moving to another Control Panel/Template page to have a quick peek at some data. Live Look, image files, and Pixel&Tonic's Matrix can be opened through a modal window right from Zenbu! reduce the amount of characters displayed in text-type cells? see Matrix fields directly in your entry listing? control what URL is used for LiveLook within the entry listing? Instead of the standard EE Edit entries link, the included extension enables easy access to Zenbu from the control panel's navigation under Content => Edit. Live Look: If Live Look is set for your channel, modal window loading of your Live Look page. No more redirecting to a separate page. Improved multi-entry editor: In addition to a clear layout of basic entry data, set status/sticky/allow comments settings for more than one entry at a time. Image thumbnails for images, or link to file for file fields. Multilingual-ready: Zenbu is available is English, French and Japanese. More languages can be added in future releases (for contributions, please contact me). Channel Images The original fieldtype developer has added compatibility in their add-on. Please contact the fieldtype developer for display issues. Channel Files The original fieldtype developer has added compatibility in their add-on. Please contact the fieldtype developer for display issues. Channel Polls The original fieldtype developer has added compatibility in their add-on. Please contact the fieldtype developer for display issues. Channel Ratings The original fieldtype developer has added compatibility in their add-on. Please contact the fieldtype developer for display issues. Channel Videos ​ The original fieldtype developer has added compatibility in their add-on. Please contact the fieldtype developer for display issues. Solspace Tag Further display customization available as a separate add-on. See the Zenbu Solspace Tag Formatting add-on. Solspace Primary Category Categories can be diplayed, but not the category set as "Primary Category" yet. Updater Available from v1.7.0. Previous versions needed the zenbu folder to be in system/expressionengine/third_party first. Not compatible (…yet). However, raw data stored in custom field may sometimes be displayed. Export the data from your entry search result directly from Zenbu. Hokoku adds an Export button within Zenbu to allow you to export your data in multiple formats, using your own filename and export settings. Hokoku is now available for EE4 and EE5! Hokoku requires Zenbu 3.2.0 or higher and ExpressionEngine 4 or higher. See the Zenbu description page for more information. After installing the module, a button labeled Export will appear within the Zenbu entry listing, allowing you to download the currently viewed entry results and columns as a file. Get the Zenbu + Hokoku (Zenbu Export) Bundle for 130$ and save! After displaying your entries in Zenbu, simply click the Export button and select your export profile. The file will then be automatically prepared and sent to your browser for download. Create export profiles and choose the format (CSV, HTML, JSON) and filename of the file that will be exported. For CSV files, for example, determine your own delimiter and enclosure characters. EE Date formatting can be used in the filename for automatically timestamping your exported files. The Permissions section allows you to control if users can use their own, per-member export profiles, and/or export profiles common to their member group. Control who is allowed to administrate export profiles. Individual- and member group-based export profiles. Filenames can contain EE date variables. Perfect for creating filename timestamps. Permissions section to control who has access to the export profile manager, as well as admin/view access to individual and member group-based export profiles. Edit. Save. Done. All without opening an entry form. Maybe there's something you want to add to your entry. Maybe you want to change that entry image. Maybe you forgot to fix that typo. ...but you have to open that slow, long, complex entry form in the CP. Click, wait, wait, scroll, scroll, wait, type, save. Henshu (a.k.a. Zenbu Edit) is a Zenbu add-on that allows you to select, directly from Zenbu or the native CP Channel Entries listing, exactly what you want to edit, without ever opening the entry form. Henshu requires Zenbu and ExpressionEngine®. See the Zenbu description page for more information. With the Zenbu entry manager installed, a small edit icon will appear when hovering over each entry data element, such as the entry title, date, status, author, custom field, etc. Click this icon to start editing! Save your changes and Zenbu updates the data! Select a few entry data elements at a time and start editing multiple entries! Don't have Zenbu (yet)? Edit Single Custom Fields from the Native EE Channel Entries Listing! Don't have Zenbu? 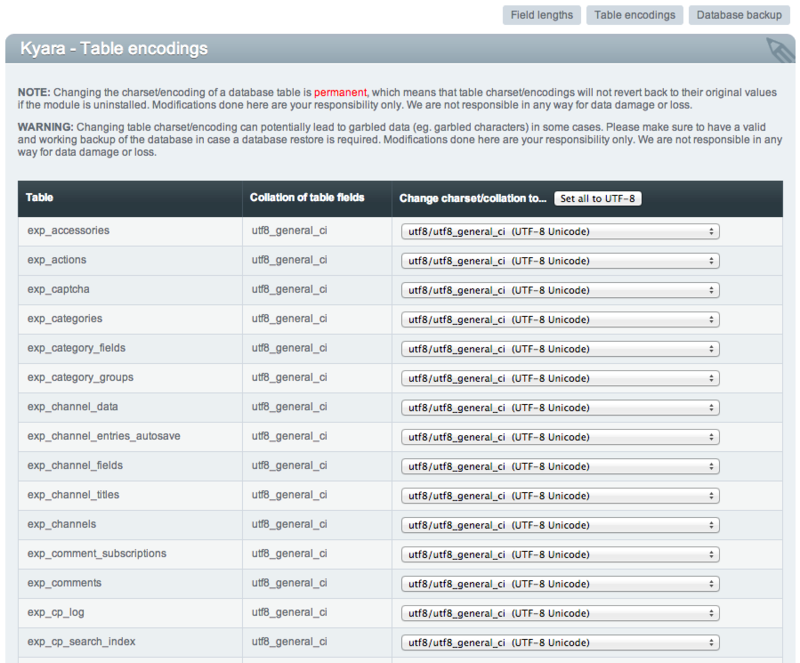 (You're missing out on something amazing, by the way) Henshu works with the native EE Channel Entries Listing, too! From the native EE Channel Entry listing, click the "Edit" link next to your entry, select the custom field you want to edit, and that custom field will be available for you to start editing. All without opening that clunky entry form! Zenbu (1.8.3+) is highly recommended to fully enjoy all the features Henshu has to offer. Reduced steps to multi-entry editing of custom fields. Kyara enables longer maximum characters in entry titles and other fields, easy conversion of tables to another collation/encoding, and simple database backup using CodeIgniter's database backup tools. * Kyara comes from the Japanese word "キャラ", which is a shortened word for "character". Enable longer maximum characters in entry fields and more! Need more than 100 characters for that entry title? Enable longer maximum characters in a number of control panel fields, such as entry title and custom field labels. 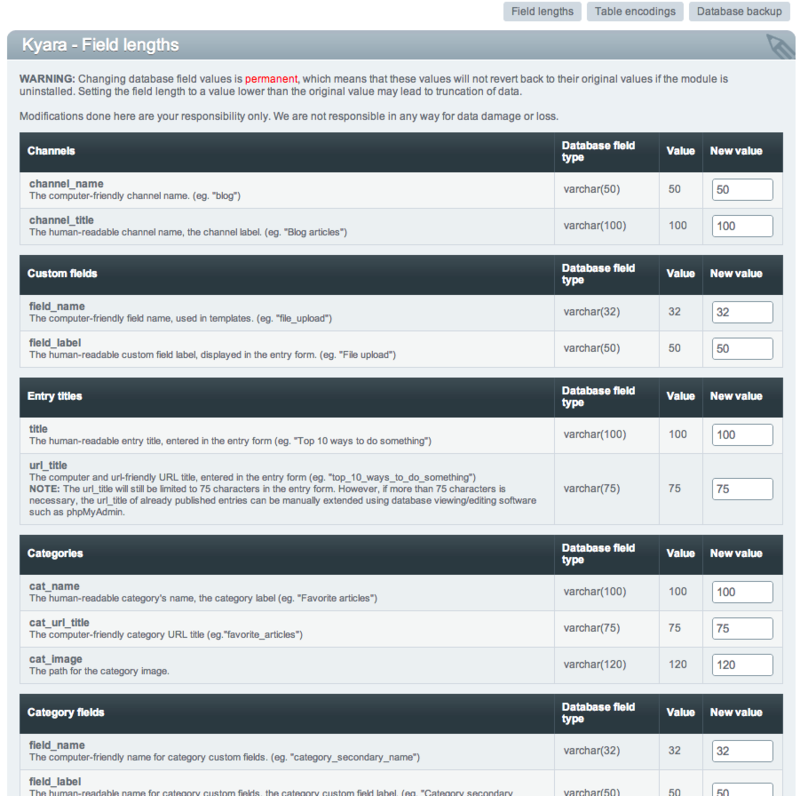 Simple descriptions of each modifiable field are also included. Easily set tables to Unicode (UTF-8) if they aren't set already, or other encodings if you have special character set needs. 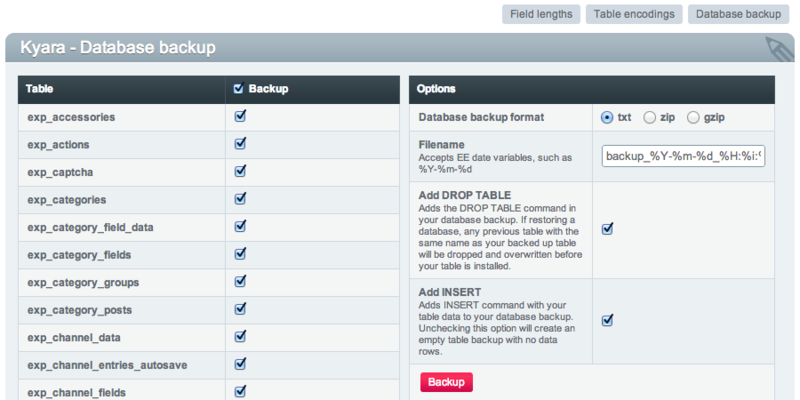 Kyara includes a simple database backup utility based on CodeIgniter's database backup library. EE Date format variables are also available. Zenbu* for Craft is a powerful and customizable entry manager that allows users to view entries’ custom fields, ID, title, URL slug, categories, authors, statuses, post date, and more, all in one list! Search criteria can also be saved for later for easier retrieval. Show/Hide any entry data or custom field, and change the order in which data is presented with simple drag & drop. Matrix: Display Matrix data inline (with height control) or in a modal window. Assets: Display asset thumbnails in custom sizes. Position Select: Display position as text, icon, or text & icon. whose title begins with “Top 10”? Such searches are possible with Zenbu. The combinations are endless with an easy to use, flexible and powerful filering system. Clients and Developers alike will love the ease of finding the entry information they’re looking for, without having to visit individual web pages or entry forms. 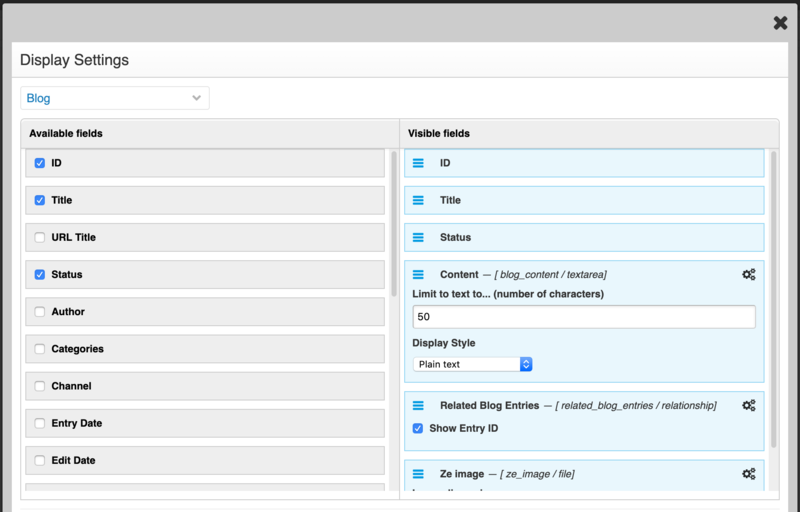 Each user can have their own display profiles, enabling users to customize what entry data they want to see in Zenbu. Need to tweak the display of entry data further? Need to add support for a third-party fieldtype? Zenbu allows you to use your own Craft/Twig code to customize entry display beyond what Zenbu offers. No need to setup display settings individually for each user or user group: Zenbu allows you to apply your display settings to other user groups, speeding up Zenbu display setup for your client user groups. Not a fan of infinite scrolling? Want to know how many entries are in a section? Zenbu displays paginated results (with control over the number of results per page), as well as the total entries found. Zenbu can filter your entries based on locale, as well as display entry data in that selected locale. Once installed, Craft will display the Zenbu plugin sections in its sidebar. You can change mentions of Zenbu in the interface to the label of your choice, eg. “Fancy Entry Listing”. Zenbu can be installed or uninstalled without the worry of affecting your entry data or setup. You’re not “locked in” using Zenbu once installed. Although Craft offers display and reordeing of entry custom fields in its native entry listing, options may sometimes be limited. With Zenbu, you can apply Zenbu’s display settings in Craft’s native entry listing. Add a status column to the native entry listing. Control how status is displayed based on Zenbu’s display settings. Display more than one category in the native entry listing. Any plans for Zenbu for Craft 3? Yes, Zenbu is planned to be available for Craft 3. However, there is no ETA for release at this time. As of this writing, Zenbu is currently compatible with native Craft fields. Simple third-party fieldtypes may display the content as stored in the database, whereas more complex fieldtypes will provide raw data in a modal window. You can also customize the display of your third-party fieldtype by using the Custom Display Template feature in Zenbu’s Display Settings (Zenbu 1.2.0+). * Zenbu comes from the Japanese word “全部”, which means “everything”.